»MATTER«, theclosing´s third album and their first as a duo, sees Daniela Palma Caetano Auer and Alexander Hengl paint their own sonic world with a colourful palette of musical influences. Mixing analogue and digital sources, sheer noise and harmony, distant sounding snippets from everyday life and processed vocals, »MATTER« comprises material that is based on long-form improvisation. 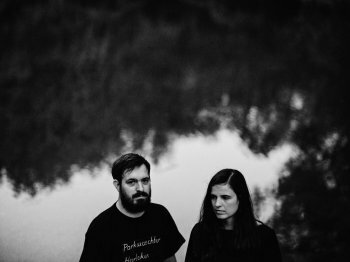 The Viennese producers draw heavily on textural ambient, post-rock dynamics and adventurous forms of electronic music on their debut for Berlin´s Anette Records to paint a holistic picture with musical means. »MATTER« is thus a record dedicated as much to catharsis as to genesis - to closure, but also to the ways that take you there. »AERIAL« opens the flipside as a slowly unfolding piece that harkens back to the heydays of the clicks´n´cuts style before picking up speed with a throbbing techno groove. The title track closes the album with a tense organ-like loop that provides the template for broken beat experimentation from which a steady groove arises after a while, marching forward towards something entirely different. It is the perfect closing statement to an album which explores the relationship between matter and energy, and which is both emotionally and spiritually charged but which, most of all, does not at one second compromise stylistically or otherwise. Frozen lake, winter sun. The sound of the northern wind. Loss and loneliness. Scars and bruises. Heart in hope. Blue, red, white. Ambient and drone.